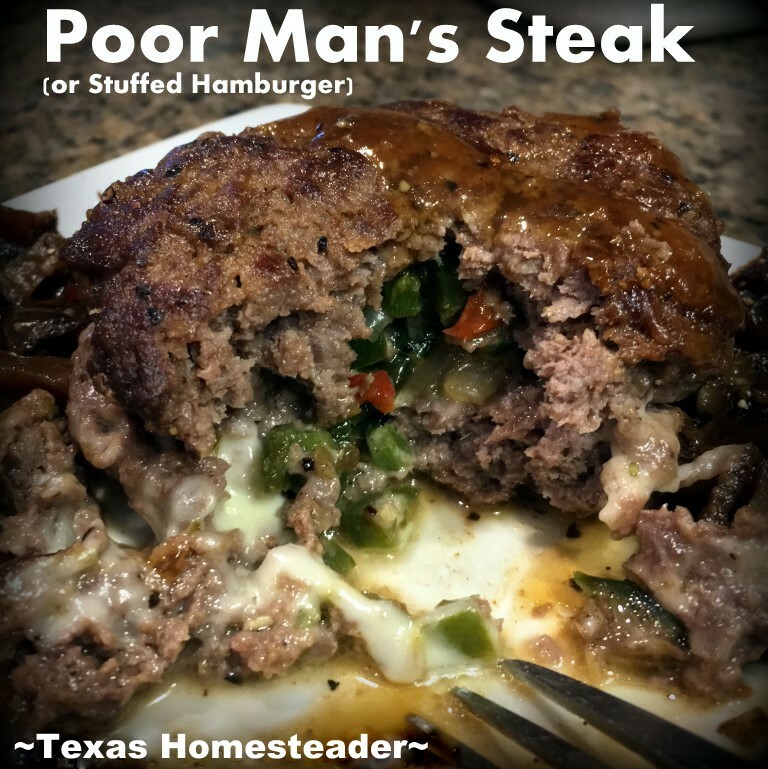 Tonight I’ll attempt a dish RancherMan & I enjoyed at a restaurant over the weekend called ‘Poor-Man’s Steak’. It was a thick 7″-8″ serving of hamburger stuffed with grilled onions & peppers along with melted cheese. It was served on a bed of fried potatoes with brown gravy drizzled over the whole shebangie. (a real man-pleasing meal, that’s for sure!) RancherMan has raved about it ever since. Let’s see how close I can come to that dish today. I’ll be using ground venison instead of hamburger, so I pulled the ground venison from the freezer last night to thaw in the fridge. Today with the venison thawed I rehydrated some dehydrated cubed potatoes by covering the cubes with water & allowing to rehydrate for about an hour. I’ve already got homemade broth in the fridge for making the gravy. I’ll thicken it with cornstarch. Grill the onions, bell peppers & jalapenos on a griddle coated with bacon grease & set aside. 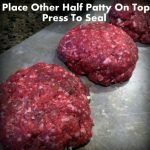 Season ground beef with 1 teaspoon salt, 1/2 teaspoon of pepper & 1/2 teaspoon onion powder. 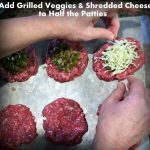 Separate the 2 lbs of ground meat into sections of just under 1/4 lb each, resulting in 10 halves (5 burgers). Fry each side until done - about 5-6 minutes each side. Serve them on a bed of fried potatoes and ladle on brown gravy. 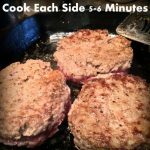 These burgers are thicker than normal so it takes a little longer to cook them. I cooked each side about 5-6 minutes so I could make sure it was well done all the way through. 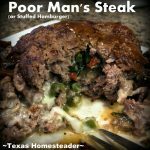 This entry was posted in Blog Posts and tagged Cooking, Recipes on January 28, 2018 by Texas Homesteader. If you didn’t want to go the Cream of Mushroom route; a brown gravy is also good, but in oven, covered for about 30 minutes, uncover, top with cheese and put back in oven until cheese begins to melt. Oh My Goodness; it has been ages since I have made these; leaving out the jalapenos and replacing with finely diced/sliced mushrooms. I do mix up a can of condensed cream of mushroom soup, whole milk, then stir in freshly chopped parsley which makes up the ‘gravy’. 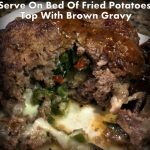 After frying- browning / searing up my burgers on both sides I transfer to greased baking dish, then evenly top with gravy and cover dish with aluminum foil and bake for 30 minutes until heated thoroughly. This recipe looks ‘do-able’ for me 🙂 .. I do believe my husband would also love it. We too, have plenty of venison in the freezer. I’ll put ours over a bed of rice. Sounds delicious. Thank you. Appreciate you!!!!!!! This is on the regular rotation. 5 or 6 times now and again tonight. Thanks! We’ll be trying this one!! Sounds delish!! I’m going to try this. Sounds so good!